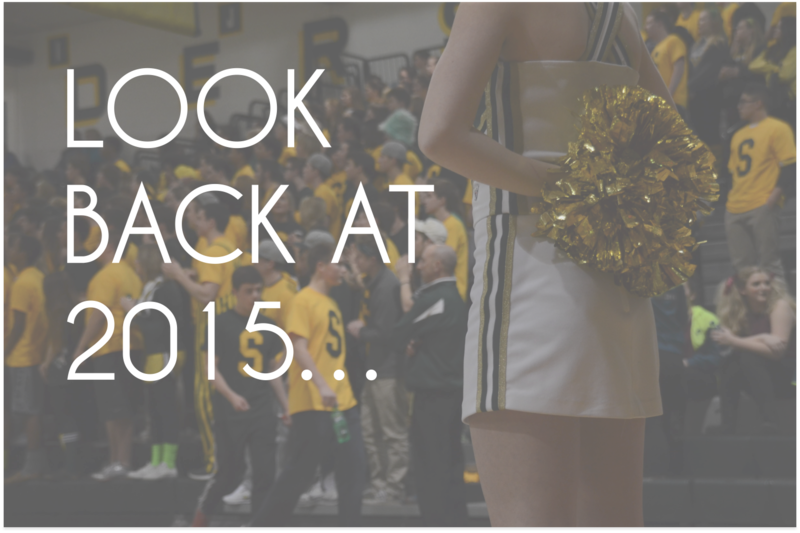 A year that was full of as many lasts as it was firsts, 2015 is definitely one to remember. Between graduating from high school and starting college, this year was nothing less than pivotal in my life. Looking back, I'm not entirely sure how I feel about a few of the decisions I made, but I'm also one who believes that everything happens for a reason. Therefore, this year is just another chapter for the books, so join along as I take a walk down memory lane and reflect on one of the craziest years of my life so far. It was March of 2015 when I decided to truly dive into my blog. 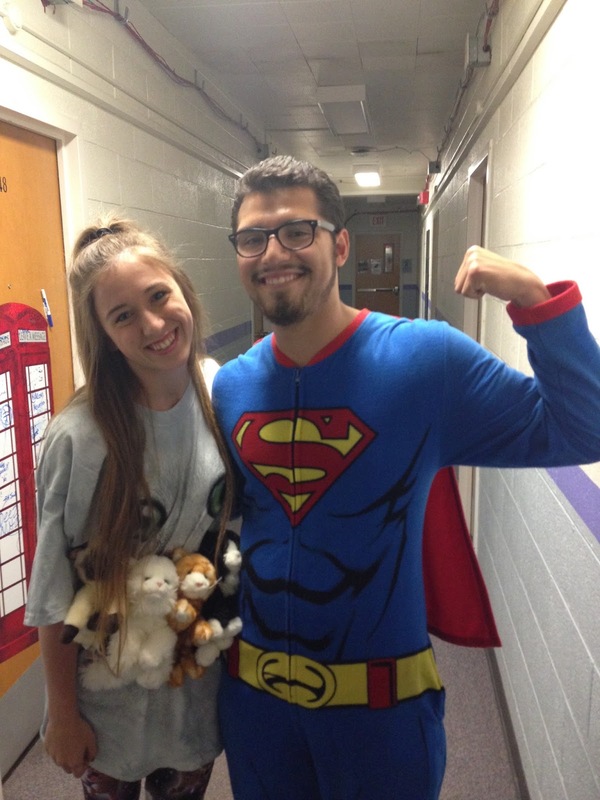 It became a fun, creative outlet for me once the cheerleading season had come to a close, and I was left with a lot more free time than I was used to. I believe this was a pivotal moment in my life where I realized that fashion was more than just trying to look cute at school occasionally to me, but rather an actual passion of mine. Falling for Autumn has opened my eyes to so much over the past year, and I cannot wait to see how both it and myself grow in 2016. I cannot thank y'all enough for supporting this adventure of mine in 2015, so since 2015 will soon be coming to a close, I have rounded up my 15 favorite looks from 2015! I used to think turtlenecks had their time and place, and that was in my mom's closet during the early 2000s. I even recall having a couple in my own closet back then, including a lovely, lavender, itchy snowflake one (shutters). But they have made a comeback this season, and I will be the first to admit that while I was at first hesitant, I have happily jumped on this trend and don't see myself going back anytime soon. 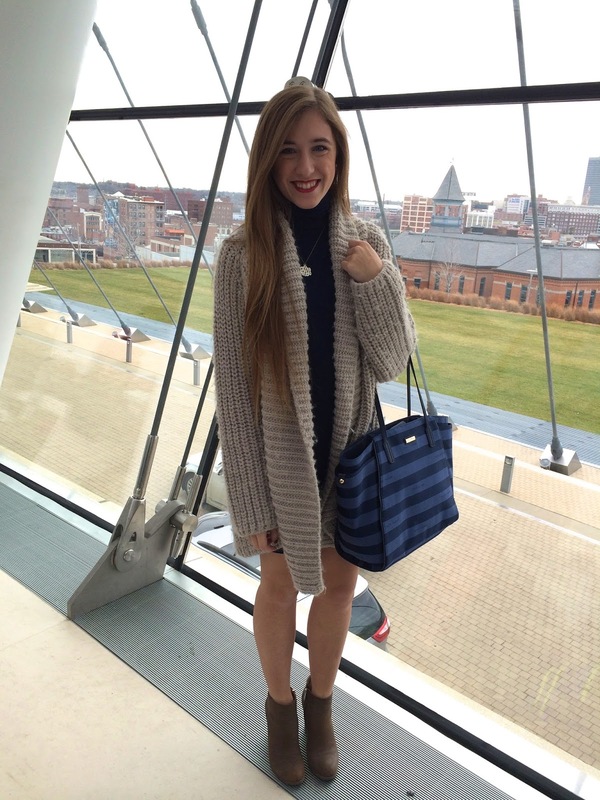 Yesterday my family went to see my sister perform in Kansas City Ballet's The Nutcracker at the Kauffman Center for the Performing Arts, easily the prettiest building in Kansas City. Between my sister dancing and my mom teaching ballet, I don't think I've ever gone a year without seeing The Nutcracker at least once. Although, this year Kansas City Ballet's Artistic Director Devon Carney presented a brand new production of this holiday classic, and it may be the best performance of The Nutcracker I've seen. 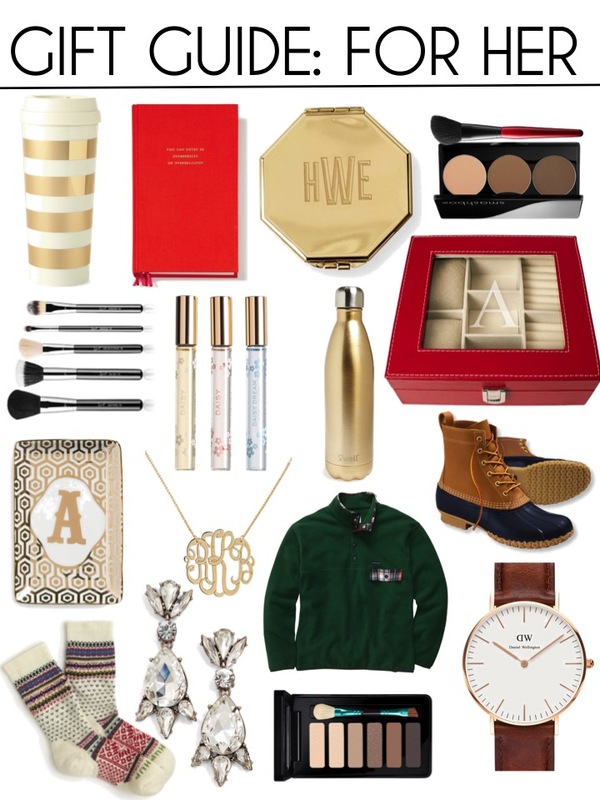 Today I am sharing with y'all the ultimate gift guide for her. (assuming "her" is Autumn!) I rounded up a list of a few of the main pieces I've had my eye on this holiday season, which I'm sure any other girl would love as well; so whether you're looking for inspiration for your own wish list, what to get the lovely lady in your life or to treat yourself, I've got you covered! This vest is without a doubt one of the softest things I've ever touched in my entire life, and wearing it with a t-shirt dress made this outfit unbelievably comfortable. T-shirt dresses have actually become my favorite thing to wear lately; they're both feminine and comfy! 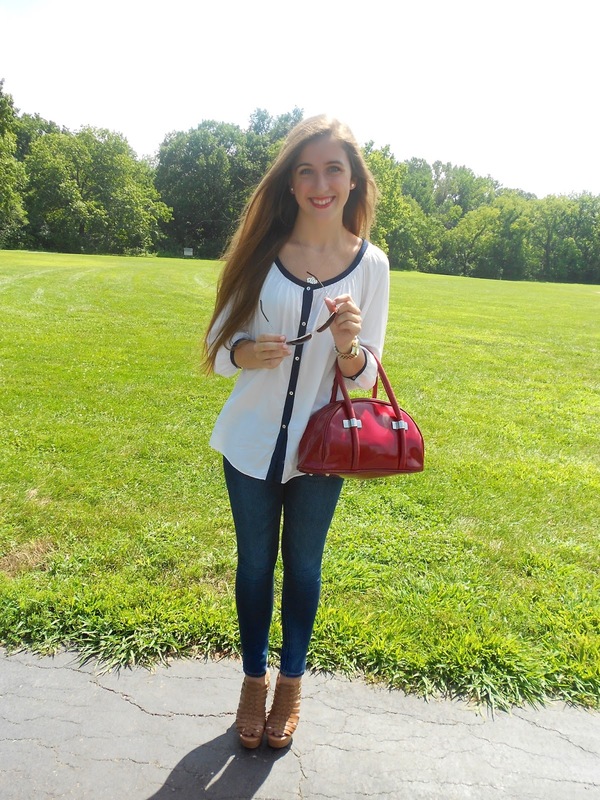 Also, the little peek of burgundy in the necklace makes for the perfect dash of color. I'm not even exaggerating when I say this has been one of my favorite outfits ever! I have always found figuring out what to get the guys in my life as a gift one of the most difficult tasks, and I'm sure I'm not alone on this. 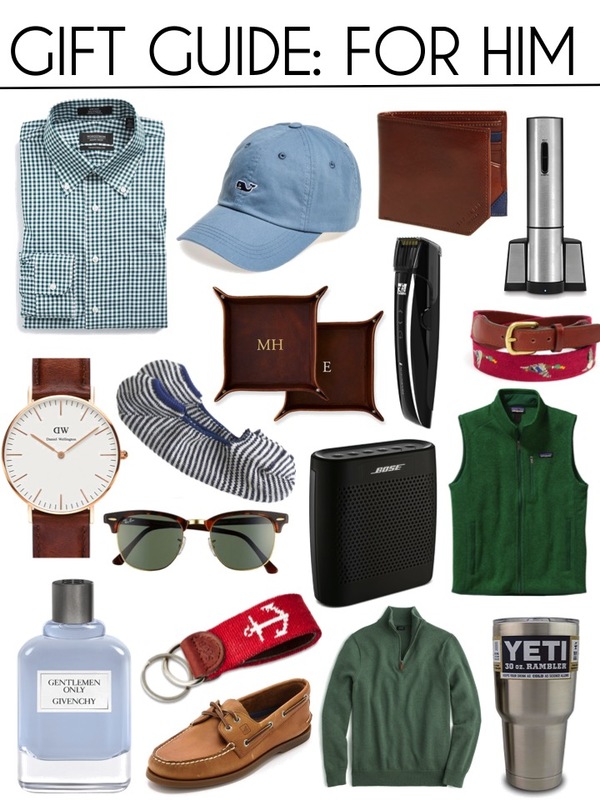 With the help of one of my best guy friends, Victor, I was able to compile a gift guide for the men in your life, boyfriend, dad, friend, etc., that is also guy approved! If I've learned one thing throughout this process it is that unlike us girls whose wish lists tend to change drastically from week to week, guys' often stay steadfast for a long time, so it's rather hard to completely goof up when getting him a gift! Today I'm bringing y'all another look from SCOOBIE, my new favorite boutique in KC. I feel like the pairing of an oversized chambray shirt and moto pants is the perfect balance between edgy and glam. And let me just say, this is probably one of the comfiest outfits I've worn in a long time; the pants fit like a glove and were so stretchy that I did not feel constrained like I do sometimes in jeans. (or jeggings, because who actually wears jeans anymore?!) The little peek of olive sparkle in the necklace really pulled together the outfit as a whole as well! It's officially the holiday season, therefore the season of gift guides to help those totally clueless on what to get their loved ones, friends, secret santas, etc. 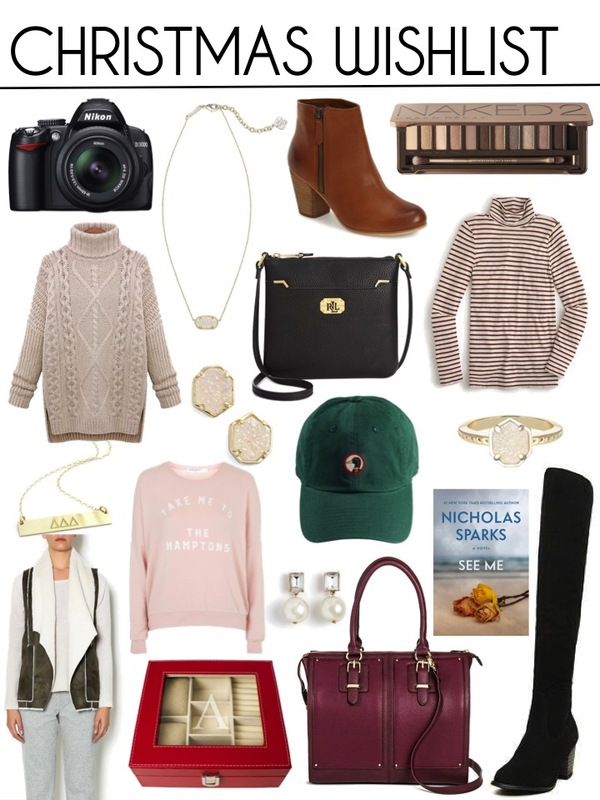 Today I am sharing with y'all a gift guide for the lovely ladies in your life; whether it be your girlfriend, best friend, mom or co-worker, I've got you covered. I have put together a collective list of ideas falling all over the price range spectrum because you definitely don't have to spend a fortune on a gift for the girls in your life to love it. Also, I'll be continuing this series throughout the month of December, so stay tuned for more ideas and be sure to let me know if you have requests! Happy shopping! Here is a compilation of the last 13 photos on my camera roll for the month of November! I hope everyone had a nice Thanksgiving break, but for now it's back to reality and time for me to finish out my first semester of college strong before winter break. Also, at the bottom of this post are all of the notable sales for CYBER MONDAY! Attention KC ladies, have I found the boutique for you! Scoobie is without a doubt my new favorite boutique in town; not only do they sell super cute and trendy pieces but they also come at extremely reasonable prices. I fell in love with this knit romper when I stopped by today. It is actually the epitome of comfy and cute. I can see myself wearing it like above when I go out with friends and also with a pair of soft tall socks for a cozy day inside. I think it's safe to say this will soon become the most worn piece in my closet. 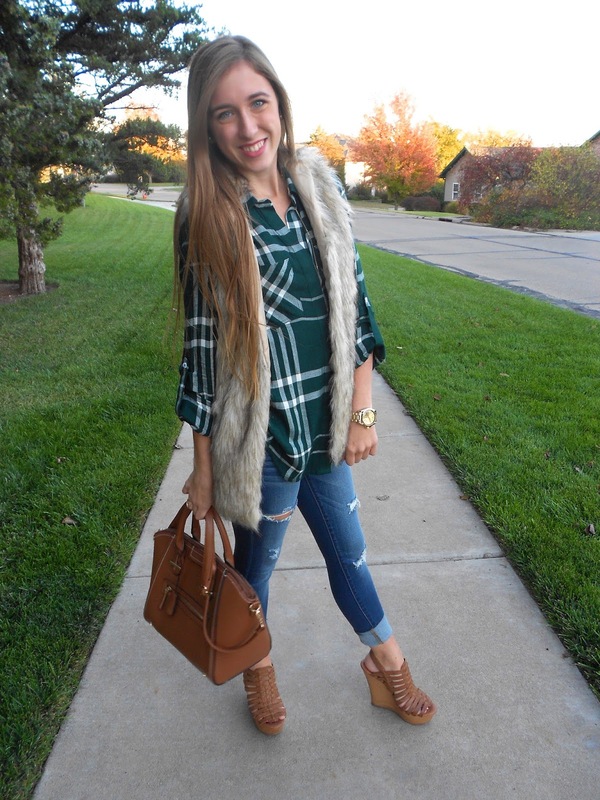 There's something about a faux fur vest that I find so glamorous, yet perfect for the fall, and pairing it with a flannel makes the perfect fall outfit. If you're looking for a last minute idea for a Thanksgiving outfit that is simple yet will ensure you're the best dressed at family dinner, look no further; just switch out the wedges for a pair of riding boots for a more casual and comfy alternative and you're reading to go. I recently got this airy LBD, and it has been a perfect piece for the confusing Kansas fall weather. You may not be able to tell from the pictures, but the dress actually has tiered ruffles all the way down, a feminine touch that I love. While I definitely prefer wearing an oversized knit cardigan with this dress due to the pretty revealing back, I still think it's a fun piece to pair with a lace bralette. This dress would also look super cute paired with a chambray button down, brown booties and an oatmeal knit scarf. With the holiday season right around the corner, it's about time you have an excuse to treat yourself. I am extremely excited to announce that Warby Parker is launching their Winter Collection today! 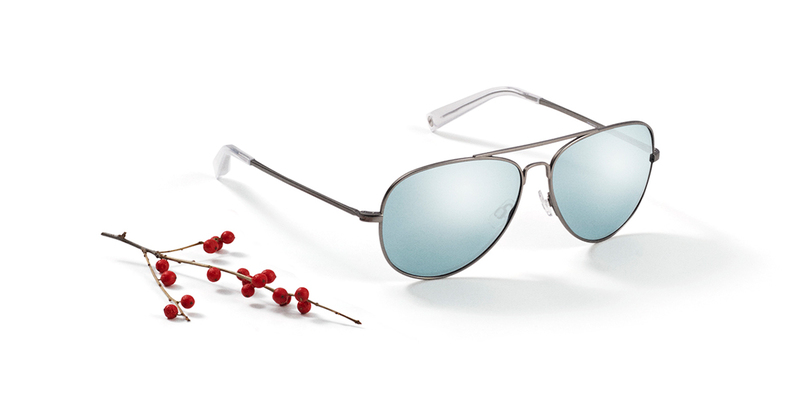 Whether you're blind as a bat or are trying to shade your eyes from the harsh sunlight Warby Parker has you covered with a wide selection of both popular and unique looks that are all worth drooling over. No joke, I've been obsessed with them since I first started wearing glasses two years ago. I never used to be a huge jewelry person. I had my everyday necklace and earrings, and I was content with that. Recently that has started to change though, as I have been more interested in trying out different jewelry trends, but I still cannot justify spending more than $20 on jewelry that I don't know if I'm going to wear a lot. 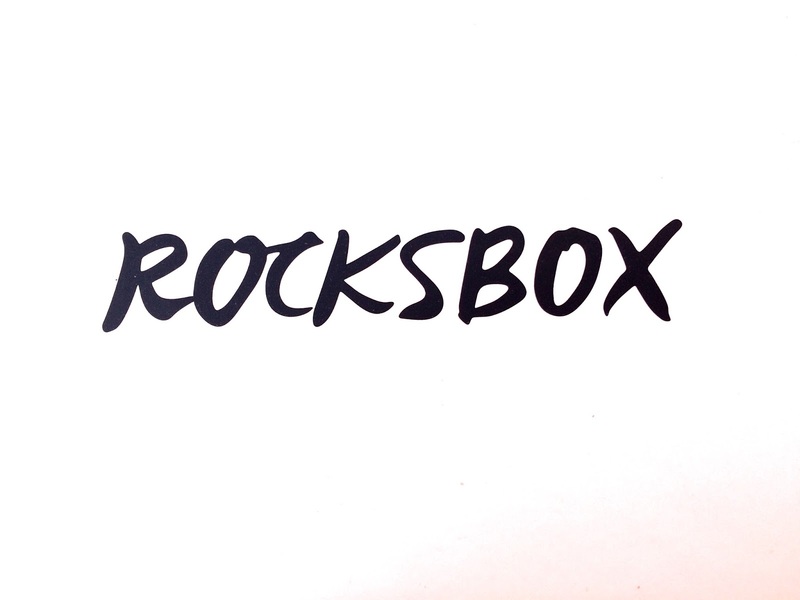 (call me cheap) That's where Rocksbox comes in. Rocksbox, a jewelry subscription box, is the solution to both every jewelry hoarder and skeptic out there. Don't be fooled, the end of summer doesn't mean it's the end of maxi dress season. Earth and jewel tone maxi dresses can be the ideal feminine transitional piece for this untraditionally warm fall weather. Believe it or not, I actually purchased this dress from Forever 21. (crazy right?!) I'll give it to Forever 21; while a lot of their pieces are poor quality items that I wouldn't dare wear after my freshman year of high school, sometimes you can find a hidden gem in the lot. And this dress right here was one of those gems. Not only was it less than $20, it is also amazing quality and the neckline is to die for. Layering button downs over tees has become one of my go to outfits recently and for good reason. I have yet to find a comfier way to layer this fall, especially since super warm and heavy layering isn't quite necessary yet (it's 79 degrees outside right now where I live...). But I cannot complain! I will take warm over cold weather any day! Here is a compilation of the last 13 photos on my camera roll for the month of October! One thing I love about living in the Midwest is that there are actual pumpkin patches to go to, unlike in New Orleans where "pumpkin patches" are just pumpkins lined up on wooden pallets. It's an activity that brings me back to my childhood, and one that I still look forward to every October. I did go pretty late though, so the pumpkin patch itself was more or less a pumpkin graveyard; I'm pretty sure the little pumpkin I am holding in one of the pictures above was the only whole one left. 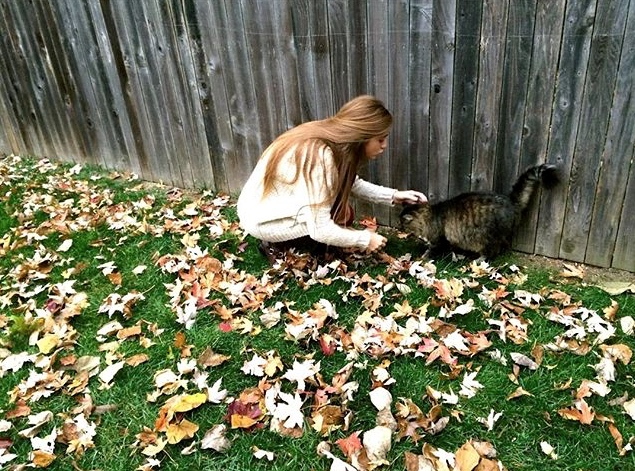 Nevertheless, it was still a beautiful fall day and there were several other things to do such as corn mazes and a petting zoo! I'm not a girl who gets super into sports; I can feign excitement during a game, but let's be honest here, I just like an excuse to get dressed up. While I may not live in the South, where tailgates seem turn into a fashion show for girls, I still love putting together fun and feminine outfits, like this t-shirt dress paired with a blanket scarf, to cheer on the cats! It's finally the weekend! I don't know about y'all, but for me this week seemed to drag on forever...while I really got off easy this week when it came to school, one day I didn't even have class and all the other days besides today I didn't even have to wake up before 11 am, but this morning I did have to give a speech for my public speaking class which I have been low-key dreading all week. Only four other people ended up showing up to class though, so that made it a lot better. Nonetheless, thank goodness it's finally the weekend! To kick off the weekend, I'm going to share with y'all 10 fall trends you should be embracing right now! Fall is by far my favorite season when it comes to fashion; it allows for so much individualization through layering and accessories that it's impossible not to have fun with it. 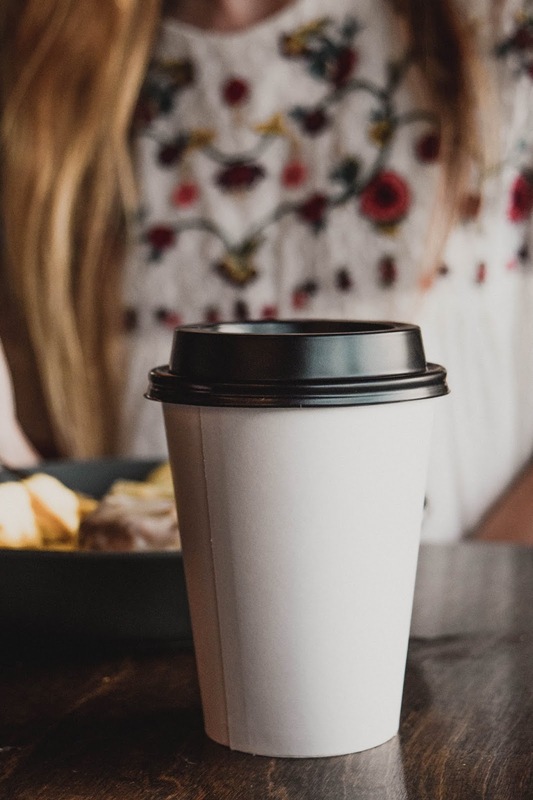 I've compiled a few examples of my favorite ways each trend has been styled as well as shop able links for each one; you may even want to take some time out of your weekend to add some of these trendy pieces to your wardrobe! Even though it hasn't felt like fall much at all here in Kansas, I just couldn't wait any longer to break out my fall clothes. I'm a lot more into light and bright colors so light chambray and cream paired together for the fall is definitely right now my alley. The combination looks super crisp and clean unlike many fall outfits that tend to lean towards the darker end of the spectrum. But I'm still a sucker for the gorgeous fall jewel tones, so this beautiful statement necklace I got from Red Dress Boutique a while back was the perfect touch of fall glamour for this outfit. Now let's be honest, every girl appreciates a guy who knows how to dress well. Now I'm not saying for you to get the men in your life on the latest trends such as the man bun, but hinting at ditching the dreaded cargo shorts and old t-shirts wouldn't hurt. My friend Nate was generous enough to share some of his fall outfits, and I have also included a list of my fall essentials for men. This is a long overdue post, so I'm sorry a lot of these posts are from the summer, but hey, better late than never, right?? 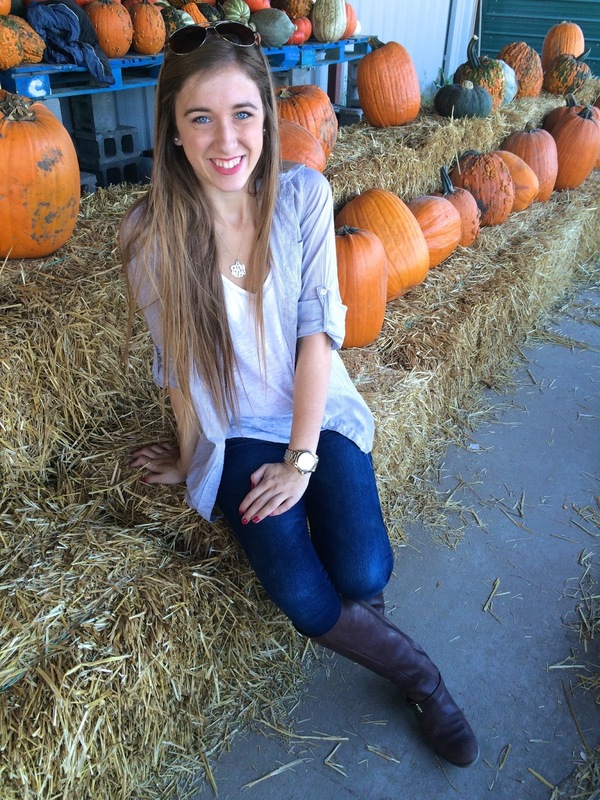 Here's a little throwback to my first blog post now that it's finally starting to feel like fall! Yes, I am wearing yet another olive green layering piece; I wasn't kidding when I said I'm a little obsessed. I love the blush and olive color combination; it's the perfect way to make pink work in the fall. But by far my favorite part of this outfit, is how the detailing on the scarf is embraced by the top and cardigan. That's one of the simple things in life that brings me the most happiness, when you can discreetly and perfectly match your outfit. Layers are absolutely necessary for me in the fall time when the temperature changes drastically between the time I leave my home for the day and midday. While I would much rather be sweating than freezing any day, I would still much rather have a jacket I can simply tie around my waist when it gets too warm. Layering really allows you to have a lot more fun with your outfits in the fall time, as it gives you the opportunity to mix patterns and fabrics to really create a unique outfit. Here is a compilation of the last 13 photos on my camera roll for the month of September! Let me get this out of the way right now, this top is so old, like I actually have no I idea where it came from or how it got into the depths of my wardrobe. Regardless of how old it is, I still think it is such a cute fall blouse. The wooden buttons down the front really bring in a more rustic and fall touch to the top; also, the cut of the blouse creates the illusion of an elongated torso which can be nice. The mix of blues and browns is a very simple yet flattering fall color combination, and the cream cardigan adds the perfect touch of brightness to the look. I will be the first to admit that shift dresses are hard for all body types to pull off, especially if you're on the shorter side, like me. But that's nothing a nice pair of heels can't fix. I especially love this shift dress from Lulu's; they are just the right length for my height! (5'4) I actually have the exact same dress in magenta as well. I have also hopped on the tassel earring trend, and I could not be more in love with them. They are super light and are pretty affordable as well. Some darker colored ones are definitely on my wish list this fall! 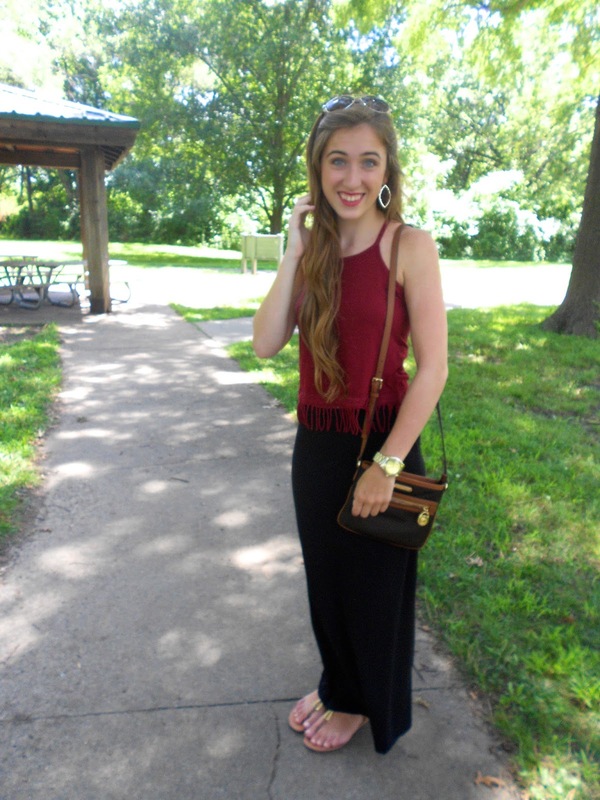 Maxi skirts are probably one of the comfiest and easiest to wear women's clothing items in existence, and they are also the perfect item to pair with a crop top for a more conservative look. I'm not really the type of person who likes to walk around flaunting their midriff (nothing against girls who do, I just don't feel comfortable doing so), so a high waisted maxi skirt is the perfect solution for me. 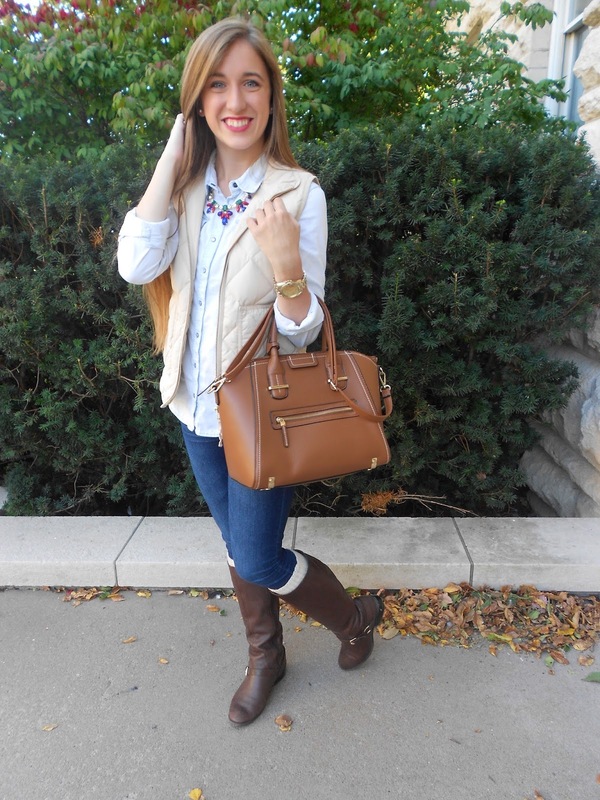 This look is perfect for the weather right now, where it's way too hot to wear most of your fall wardrobe. 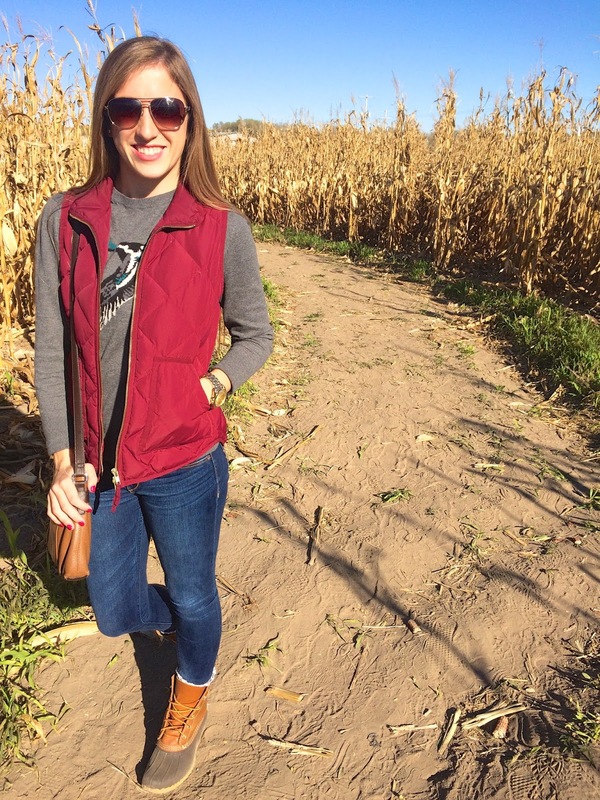 It's officially the first day of autumn (you could say I'm a little too excited), and even though the weather here in Kansas may not have gotten the memo, we're still one step closer to being able to finally break out our fall clothes. Today I decided to share with y'all a super simple and classic fall outfit. I love peasant cut blouses for the fall; I think they are extremely flattering on many body types and aren't super tight and constricting. This outfit would be perfect for the early fall when you don't quite need to pile on the layers or fuzzy socks under your boots. Rather, this is a cooler look that still incorporates the season's colors and styles. As the days start cooling down, it's time to start layering up and taking advantage of the days when you can wear clothing that doesn't require you to shave your legs everyday. 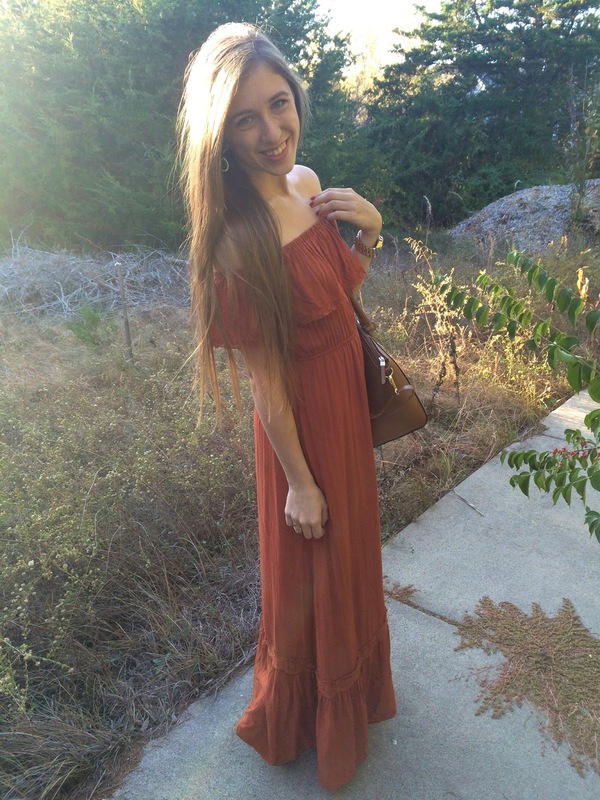 One of my favorite fall pieces are maxi dresses because they are effortless and comfortable. The plum color of this one is especially fitting for the fall season with its deep hue, and the light cream cardigan is an ideal light and feminine layering piece. If you're like me, even when the temperature drops into the 60s I need some sort of sweater or jacket...I'm a baby when it comes to chilly weather. True story: I used to refuse to wear the color black (except leggings), call me crazy. But since I've been at college I've had to buy several black items, and I'm actually starting to enjoy wearing the color black! I know understand why people call it such a slimming and classic color to wear, and since I'm not at home I don't have to worry about getting cat hair all over me! This outfit would be perfect for going out on the weekend. The spandex shine of the leggings dress up the outfit, so you could replace the heels and still get the same effect. Also, the royal blue clutch pulls out the detailing on the neckline of the blouse. This is yet another perfect transitional outfit for when you're not quite ready to pack away your summer brights. I don't think you could possibly find a much preppier sweater than a cricket sweater and pair it with some J.Crew chino shorts and Sperry's, and you're ready to go. Sweaters with shorts is one of the easiest and most typical transition outfits between summer and fall and winter and spring, and once I got my hands on this cricket sweater I knew it would be perfect for those chilly mornings and nights. Another thing I love about these sweaters is that they can make an outfit look both super relaxed and put together at the same time, something a lot of us girls strive for on a daily basis.